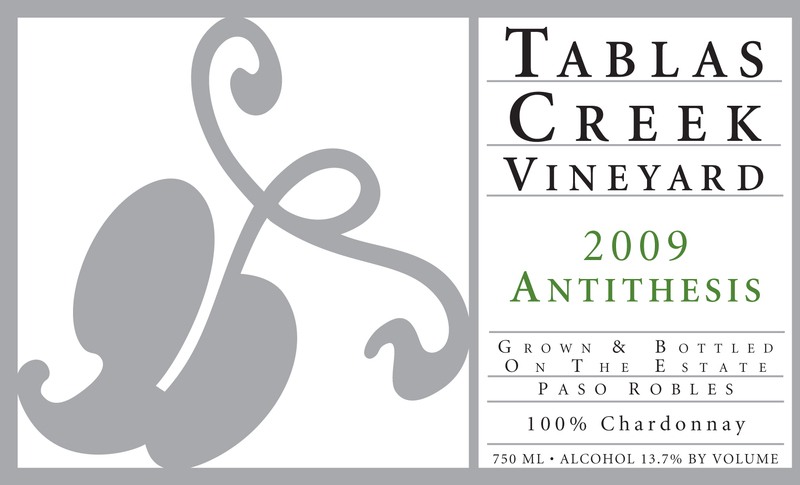 The 2009 Tablas Creek Vineyard Antithesis Chardonnay is Tablas Creek’s tenth bottling of this traditional Burgundian varietal. In the early 1990s, we imported all our Rhône varietal cuttings from France. At the same time, at the request of a Sonoma winery, we imported the highly regarded small-berry, low-vigor Chardonnay clone named “La Vineuse” and planted 1.5 acres to produce a small amount of bud wood for sale. In 2000, we got our first small crop of Chardonnay. The 2009 Antithesis shows a rich, creamy nose with pear and anise notes balanced by mineral. The mouth is lush but dry, with supple texture and a generous mid-palate. The flavors are classic Chardonnay, with ripe pear, preserved lemon and mineral and a very long finish. Drink now and for the next five years. After tasting the grapes, we thought them so compelling that we made the Antithesis Chardonnay our first non-Rhône bottling, as well as our first single-varietal wine. We have continued to produce a small amount each year since. Our Chardonnay grapes were grown on our 120-acre certified organic estate vineyard. Chardonnay thrives in our chalky clay soils (much like those of Burgundy), and the cool nights in Paso Robles serve to balance the warm, sunny days. We chose a terraced north-east facing block above our grapevine nursery for the Chardonnay. The 2009 vintage was our third consecutive drought year, with yields further reduced by April frosts. Berries and clusters were small, with excellent concentration. Ripening over the summer was gradual and our white harvest complete except for a few Roussanne lots at the time of a major rainstorm on October 13th. Our Chardonnay crop sizes was were 40% smaller than 2008 and 70% lower than usual. The low yields and gradual ripening resulted in wines with an appealing lushness, rich texture and gentle minerality. Our tiny crop of Chardonnay was harvested in one day on September 15th. The Chardonnay grapes were whole cluster pressed, and fermented using native yeasts in a mix of neutral oak and stainless steel barrels to preserve the wine’s varietal and mineral character. The wine went through full malolactic fermentation in barrel. It was bottled in July 2010.